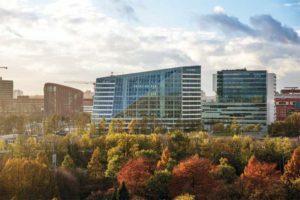 Deloitte, a global professional services firm, set out to find a new building to house its Amsterdam office, it wanted one that would change the world, as well as comply with the European Union’s (EU’s) Energy Performance of Buildings Directive 2010/31/EU. The result is the Edge, said to be one of the world’s greenest and most efficient office buildings, with a Dutch Building Research Establishment Environmental Assessment Methodoogy (BREEAM-NL) sustainability rating of just over 98 per cent, the highest ever awarded at that time. Deloitte’s building employs the Internet of Things (IoT), or devices other than computers or smartphones that are connected to the Internet, to make every aspect of the structure smarter. This technology helps make the experience inside this building unique. The Edge’s sensors recognize each employee upon arrival, and through a custom smartphone app, assign each person a workspace for the day based on his/her schedule. Its IoT-enabled lighting means each workstation can have custom light settings, which change for each employee based on their pre-determined preferences. The custom lighting panels are connected to 28,000 sensors throughout the building, monitoring motion, visible light, temperature, humidity, and infrared light. PJP Architecture, which designed the Edge, said the combination of the mobile app and the building’s architecture supports activity-based working: employees deliberately choose the location and ambience they want to work in for different tasks throughout the day. In addition to possessing these smart capabilities, the Edge is a net-zero energy building. It collects rainwater for internal plumbing fixtures and its solar panels generate 102 per cent of the building’s energy. At Deloitte, 72 per cent of employees working in the Edge said they enjoy having a sense of control over their environment. Prioritizing the employee experience and factoring it into every decision made during the design process makes Deloitte attractive when recruiting and retaining young talent. The Edge has strong design and esthetic qualities. It can be an inspiration for architects who are looking to bring their building designs into the future. Specifically, when planning for IoT capability, there are three principal considerations: data management, interoperability and future-proofing, and cybersecurity preparedness.